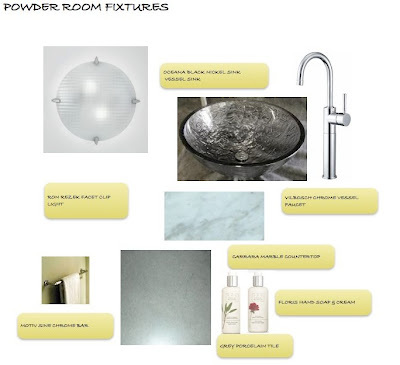 Comments left on my recent post about the rehabbed powder room and also by The Handyman made me think I should explain in greater detail why we kept the fixtures we did and how I arrived at the plan for the new ones. Between 2004 and 2006 we had a bunch of leaks, drips and other plumbing issues that resulted in a completely rebuilt toilet mechanism. When we decided to redo the powder this Spring room I didn't want to throw the WC out especially as the china looked good, it fitted the space and I'd spent more than the cost of a new loo getting it fixed. 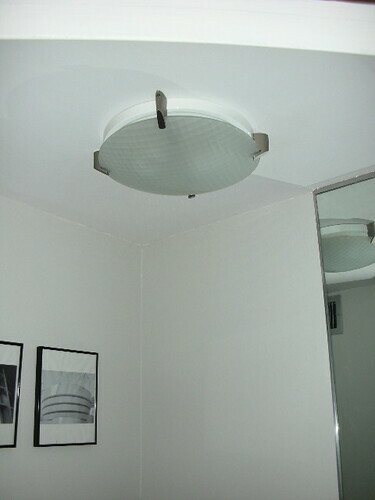 One day in 2005 the ventilator broke and when put in a new one we also tried to fix the chandelier back to the ceiling. We couldn't and neither could any other contractor who has worked on the house. We knew it had to go when we redid the room, so eventually we swapped it out for one we already had. 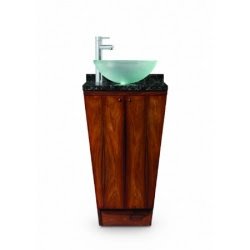 I was going to rip out the vanity and replace it with this unit but the more I thought about it the less I liked it. For one, I'd lose precious counter space, then I'd have to possibly remove the mirrors and maybe re-texture the walls. Finally I wasn't sure I liked the bowl and faucet enough. In the end it seemed like too much money to spend to get something I wasn't 100% happy with. There was nothing wrong with the original cabinet so I figured why not get rid of the part I hated, the fake marble top with its clamshell sink and tiny faucet that only elves could operate, and keep the base. The shag carpet bugged me every day. We wanted to wait until we remodeled the kitchen before we took it out but the longer we lived here the more remote that day seemed. Once we'd made the decision to keep the vanity and tile up to it there didn't seem much point in waiting any longer, we'd just get it done. Then came my favorite part: shopping. Firstly I shopped for free in the "things I thought we'd use but never did" department aka a shelf in the garage. I found a chrome towel bar I bought for the boys' bath remodel that we couldn't fit in that space. Then I started spending money. I love Carrara marble and we've used it throughout the house to update other bits of furniture so that was an easy choice for the countertop. I made a paper template and took it to the stone guy up the road and he had it cut in two days. 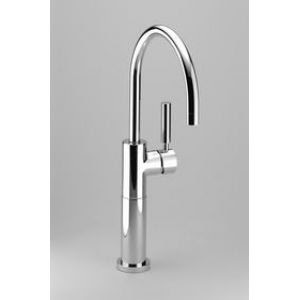 The faucet I wanted, the Tara Classic from dornbracht would have cost a stress-inducing $918 but I found a much more reasonably priced version at overstock.com. There was a brief obsession flirtation with a red vessel sink but I think the one I chose out of necessity actually looks better here. It cost a little more but it compliments the marble really well. Our ethos during the renovation of The Cool House has been to save as many original features as possible, to do as little harm as we can and accomplish it on the smallest feasible budget. Having said that I do like the occasional "wow" piece. My designer neighbor once charitably described the old powder room as "not horrible", she hasn't seen the new version yet but I hope she will approve. There's a lot of old, a fair bit of new and some things borrowed from another room in this remodel and I think it all works together. I'm happy anyway. I think it looks great! The marble and sink, faucet came together beautifully. We also have Motiv bath hardware in a few bathrooms, and I really like it. Nice job!